Scholastic Aptitude Test (SAT) aims at assessing a candidate’s application skills. SAT is basically a college admission test dealing with reading, writing and mathematics. SAT is owned by a private and non-profit organisation in USA, College Board and is administered by Educational Testing Service (ETS). Since SAT is a college admission test, it intends on testing the skills which students are taught during their school years. The best time to sit for SAT is during junior or senior year of high school. Test comprises of multiple choice questions, essay questions and grid questions. 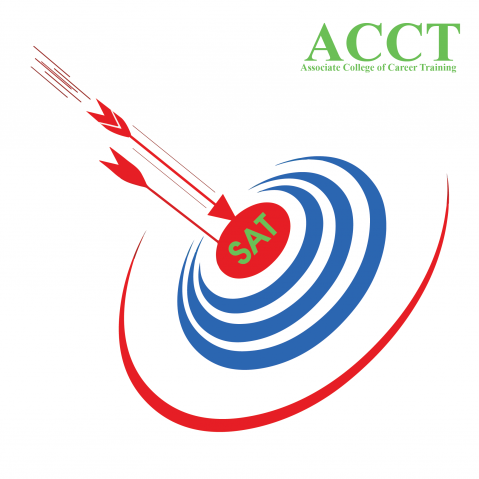 Associate College of Career Training (ACCT) is a premier coaching institute in Ludhiana for SAT. ACCT is an affiliate of SIEC and offers coaching for various study abroad tests as well as vocational courses. ACCT has established a niche for itself in SAT coaching in Ludhiana and is a preferred choice for many study abroad aspirants. Our innovative teaching methodologies are what set us apart from our competitors. There is a keen focus on strengthening the conceptual paradigm of students so that they can deal with any kind of questions. This approach is the reason behind our phenomenal student success rate. ACCT offers a comprehensive SAT coaching in Ludhiana. Experts in the field have been roped in as tutors. Class sizes are deliberately kept small so that individual attention can be given to each and every student. Regular mock tests are conducted so that students are able to assess their performance. An elaborate study material is provided covering all the aspects of examination. Most importantly, our class timings are flexible enough to be incorporated in your schedule. Thus, contact ACCT for SAT coaching in Ludhiana and give a head start to your study abroad plan. Contact us to know more about our services!